Yup. It’s one of those days. But rather than getting all stressed out, I’ve decided to treat the day as an adventure. When I first went to Molokai to begin my studies, I had to learn to let go. It was a real adventure. Like something you might see in a movie. The situations were nothing I’d ever encountered before. I was totally a newbie. A foreigner in the truest sense. When I let go of all of the preconceived notions I had of how things SHOULD be, I was able to experience things as they really were. I had to learn how to Show Up & Say “YES!” to the situations. I hated feeling unclean. I hated the way people looked at me when they noticed I had “dirty hands.” It was like there was something wrong with me. Something bad. So when Pops told me that I’d be working in the loʻi (taro patches), I was excited–and nervous at the same time. Pops loʻi are for wetland taro. Now, I’m no taro expert! But I know that the loʻi are fed by cool, clean water all day long. And you know what that means? LOTS OF MUD! 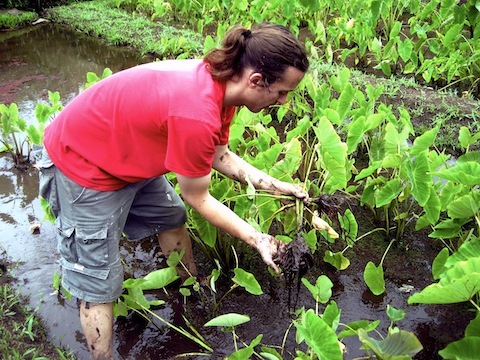 The first time he explained how to harvest the taro, he told me to put my hands in the mud. And like a true “city boy”, I hesitated. “Come on!” he said. “You can’t pull the taro out by the stem! You’ve got to get your hands in the lepo pōpolo (black mud)!” Instantly, my mind flooded with memories of making mud pies–and the “dirty looks” that followed. But before I could really think about it, I looked at Pops who was completely up to his elbows in the water and mud. Not wanting to look foolish, I did it, too. I loved that feeling of being in the mud again. I loved the way it squished through my fingers. And I even loved the way it stained my hands and feet for days afterwards. On Molokai, no one looked at me strangely for having “dirty fingernails.” It was a badge of accomplishment. It told everyone that I had been in the lo’i. Right on! Once I’d let go of how things SHOULD be, I was able to relax and experience how things as they really were. I just needed to Show Up & Say “YES!” to the mud! Today I’ve got a lot on my plate. I’ve got to do some things that make me nervous. I’ve got business meetings. I’ve got functions to attend. And when I woke up, I started making lists of how things “needed to happen” in order for the day to be deemed a success. I’ve been there before. Things never go exactly the way I have them planned. But rather than try to force situations to fit my expectations, I’m making a conscious effort to greet the day EXACTLY HOW IT IS. How are YOU going to Show Up and Say “YES” today? I’d love to hear from you! This entry was posted on Thursday, December 2nd, 2010 at 1:04 PM and is filed under AHC Home. You can follow any responses to this entry through the RSS 2.0 feed. Both comments and pings are currently closed. Ah, food for thought! I too, have done the “how things need to happen” for success. Of course, things never go exactly the way you’ve planned. It’s good to plan, but not to micromanage. Often, what happens is something better than you could ever have engineered.